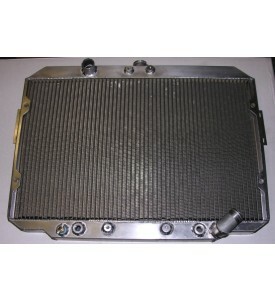 Plate and Bar style Aluminum Radiator for all Intercooler Starions and Conquests. Before installing in the car please make sure to install the drain plug and swap the temperature switches from the old radiator to the new one. They use a rubber O ring to seal so make sure the rubber is intact and not dry, if it is replace them. Install the fans before putting the radiator into the car…see below if you have a problem mounting the fans on the aluminum radiator. 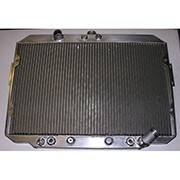 This is a very straight forward, bolt in performance radiator. We find it is very helpful to remove the battery and air intake canister; they do not look like they are in the way, but having the extra room makes it a much easier and in the long run a faster job. 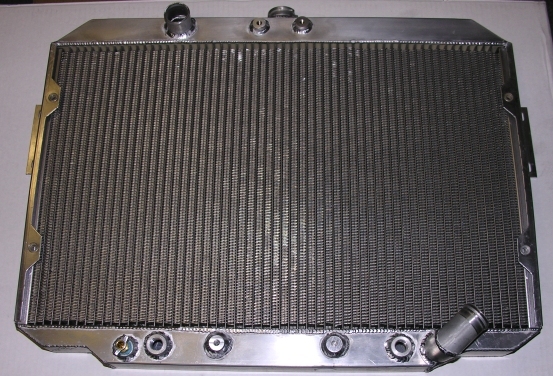 There is also an intercooler pipe running through the core support on the passenger side that makes it difficult to access the radiator mounting bolts; unbolt this pipe and loosen the hose clamp enough to rotate it out of the way while working on the radiator. Due to variances in the Mitsubishi fan shrouds it is sometimes necessary to perform some light fitment work to attach the fan shrouds to the radiator. Typically we find that the driver’s side fan is sometimes tweaked to away from the mounting holes, due to manufacturing inconsistencies and warpage over time. The fan shroud brackets are usually pliable enough to tweak into place by installing two bolts on one side and bending or pushing the shroud brackets to line up with the other holes. On certain we find it is sometimes necessary to enlarge the fan mounting holes. If the fan is off by an extreme amount from an accident or a bad used part, you can usually work them back into position by bending the bracket until the holes line up and then carefully clamping the fan in place on the radiator as each bolt is installed. From time to time we have seen these cars, both Starions and Conquests, with the radiator mounting holes shorter than the brackets on the radiator. If this is the case on your car the holes on the radiator brackets need to be enlarged to match the core support.